Starting with version 2.1. Kistler force plates can be intergrated with the camera system. The force plate system can synchronize via either clock signal or record trigger signal generated from the eSync, and the connected force plates can be configured and controlled using Motive. The number of steps to set up the rigid body based skeleton has been simplified from around fifty steps to just a handful. Made a variety of improvement to the skeleton solve to achieve more realistic tracking. This release also adds some variations to the base skeleton model including an upper-body only model (with four rigid bodies), as well as active finger markersets. In this release, a variety of improvements have been made on the application profile system. 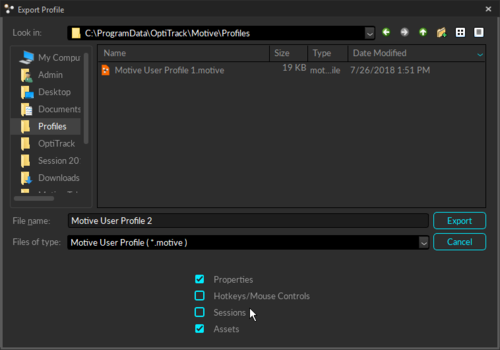 The application profile, also called Motive user profile, now has a file extension of .MOTIVE (*.motive) and gets automatically associated with Motive. Subsets of profiles can now be exported into the Motive user profile (MOTIVE) so that you can choose to store only the selected settings in the profile as needed. The user profile is still a text-readable file and you can open them in text editors. Motive files now have new icons for better distinction of different file types. In this release, the active markers can be attached to the tip of the fingers to accomplish the finger tracking. 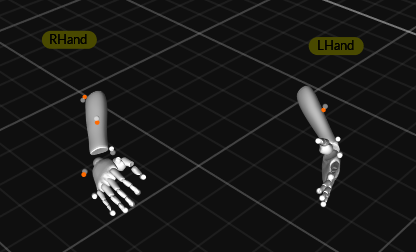 You can use the active Tags and wire the markers to the expected positions, and Motive will use the marker-tracking data to solve each finger segments. You can now switch between Live and Edit mode directly from the 3D viewport by clicking on the UI. You can also switch between passive marker tracking mode, active marker tracking mode, and passive + active marker tracking clicking on the same UI. 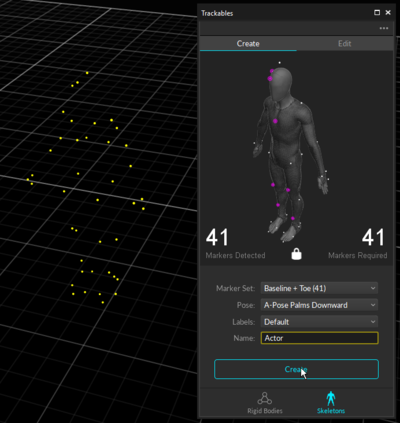 Starting with Motive 2.1, you can use the external pivot alignment tool in the Builder pane for calibrating precise position of the rigid body pivot points for Vive HMDs. The new Devices pane provides easier control over the camera system and the peripheral devices (Force plates / NI-DAQ). Device selection groups can be created and you can quickly configure settings for multiple devices at the same time. You can also select specific settings to show in the list and re-order them as needed. This gives a more efficient way of organizing and monitoring the connected devices and their settings. All of their device properties can be accessed through the Properties pane, just like other properties in Motive, providing more consistency on where to find the device properties. In this release, we have added a new Builder pane for creating trackable models in Motive. This pane includes all of the tools needed to create or edit trackable models in Motive. Using this pane, both rigid body definitions and skeleton definitions can be created or edited. Read through the Builder pane page for more information. Starting from this release, all of the device properties are controlled through the Properties pane and this is the same for the synchronization hubs (eSync, OptiHub, I/O Box for tracking bars). The synchronization pane has been removed, but the synchronization settings will not be controlled through the properties of the respective sync devices. Sync settings and steps for settings up the sync set up is still the same. 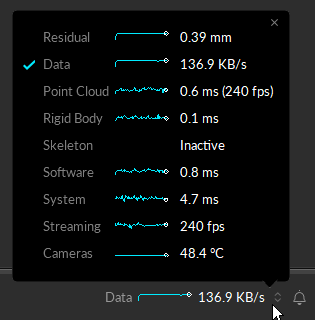 Improved the video by adding more export options for reducing the framerate, adding an option to overlay timecode data. Improved the visualization of color cameras in the 2D view. 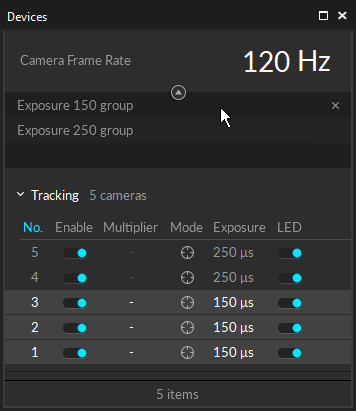 Color cameras without filter switcher will be hidden in the 3D viewport by default since it cannot be calibrated into the capture volume anyways. 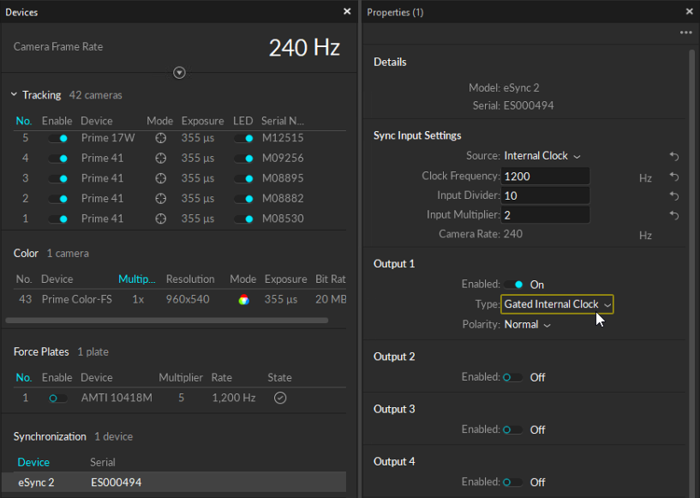 Color cameras with filter switcher will automatically switch to object mode during calibration. In addition to the previous trigger sync approach, Bertec force plates can now synchronize also by listening to an internal clock signal from the eSync 2. This means all force plates not support clock synchronization for more accurate per-frame sync. This release adds a new Rizzoli skeleton markerset, Rizzoli Lower Body (42), that incorporates the foot models with a lower body skeleton. Implemented real-time graphs for better visualizing the metrics reported in the status panel. This will allow users to better monitor any latency spikes if there is any. When tracking active markers, if any of the 3D points share duplicate active IDs, it caused conflict with the tracking. To prevent any confusion, we added a notification in the control deck when Motive detects one or more active markers that have duplicate IDs. Modified the "Auto Select" mode in the tracking algorithm setting for active marker rigid bodies to dynamically switch between marker-based and ray-based depending on the tracking situation to improve tracking quality and performance. Added AppyContinousCalibrationResult API function under cTTAPI Listener class for checking and applying continuous calibration results. This page was last modified on 12 November 2018, at 17:04.